We looked at the top 1 Packing Cubes and dug through the reviews from 2 of the most popular review sites including Land Of The Traveler, Road Affair and more. Through this analysis, we've determined the best Packing Cube you should buy. In our analysis of 59 expert reviews, the TravelWise TravelWise Packing Cube System placed 4th when we looked at the top 10 products in the category. For the full ranking, see below. Checkout The Best Packing Cubes for a detailed review of all the top packing cubes. Plenty of space with the two medium and two large cubes. Not only are they made with quality materials, but they’re lightweight, durable, and will fit perfectly in your carry-on luggage. Inside lining needs to be reinforced. PACKING MADE EASY – This 5 piece travel organizer set (1 small, 2 medium and 2 large packing cubes) compartmentalizes similar size items in their own “small drawers” to streamline packing and more efficiently utilize interior luggage space. EXTRA DURABLE – Lightweight and durable nylon stands the test of time, keeping items secure without adding weight to your luggage. FUNCTIONAL DESIGN – No more hectic searching for misplaced items! 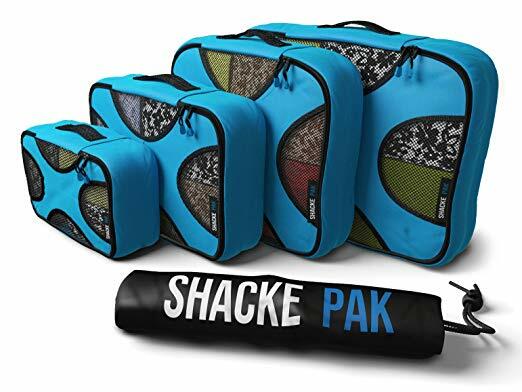 These packing cubes feature a breathable mesh design to more easily locate items in your suitcase, while 2 way easy-pull zippers provide reliably fast opening and closing, which means faster packing. ARRIVE ORGANIZED – Items won’t shift in transit, leaving you with less wrinkled clothing and more time to relax while traveling. Create a personalized packing system with all 5 squares to simplify work trips, weekend getaways, and long-awaited vacations! 100% SATISFACTION GUARANTEE – Customer satisfaction is our highest priority. Call or email us any time for support!